You may have noticed on my Master List that there are at least three rooms in the Liberty House that will eventually have built-in shelves and storage. I need places to put things, otherwise I set them down in the middle of the room and they stay there, um, forever. Now, the future study and the cupboard-under-the-stairs are places you may expect that kind of thing, but the bathroom? This is, by the way, is the first floor bath and has the distinction of being the one functioning bathroom in the house right now. Other than a small spot in the ceiling that needs to be patched (and the shower trim I replaced before moving in), it’s not in bad shape from a functional standpoint. The tile is ceramic, and the fixtures are all higher-end, but the whole thing is very… vanilla. And with the pedestal sink instead of a vanity there is exactly zero storage to speak of. 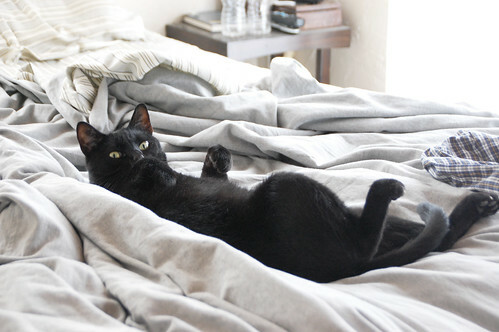 Training the cat to fetch my soap, shampoo, and freshly laundered towels when needed. Yeah. Scratch that last one. One of the things that I don’t love about this room is how the toilet feels like it’s just hanging out in the middle of the room. (Something I articulated really well in this video.) I’m afraid just sticking a vanity on that wall will feel even more awkward in what is already fairly narrow but oddly open space. Switching the positions of the vanity and toilet is also an option, but not until I have one or two more working bathrooms in the house. While adding a closet by messing with the wall between the bathroom and bedroom isn’t impossible, it would definitely feel a little “tacked on” to one room or the other. Try not to fall out of your chair in awe of my drawing skills. Or because you’re laughing so hard. The truth is you don’t often see built-in shelving in a bathroom around a pedestal sink and toilet. I’m still trying to decide if it would fit or look completely awkward. As one of the two often-used and mostly-functional rooms in the house, this shouldn’t be high on my priority list, but building the shelves feels like it would be a fun project and a fairly quick win (and I mean that relatively speaking… as in, quicker than demolishing and rebuilding the entire master bath.) Those ceramic tiles will go eventually too, but not until I’m ready to tackle the whole kitchen, and that will be a little farther down the list. So, built-ins in the bathroom? What do you think? I don’t think it would look crazy at all, if you trim it up with moulding it would look awesomely built in. That’s so funny you shared the shelf above the pedestal sink pic: I’m designing someones bathroom remodel and we’re building out the wainscoting behind the vanity so that it has enough room for a shelf on top. ooo-tough call. The addition of the built-ins around both the sink and the toilet as proposed really seems to emphasis them and maybe not in the best way. 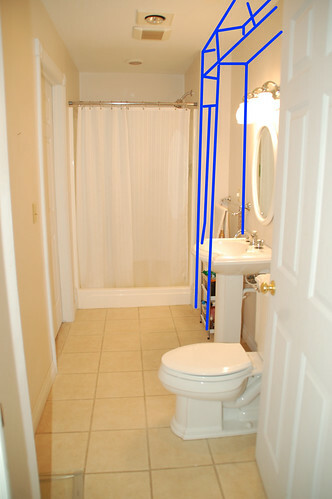 My inclination would be to construct either something floor to ceiling between the sink and the shower that does not bridge over to the toilet OR (maybe down the line) build a new sink base with storage below that extends to the shower with a seemless counter over both, possibly with additional shelving above. That would make the sink/cabinet the dominant feature of the room and maybe help down play the toilet. That’s my 2 cents Love seeing all the progress! 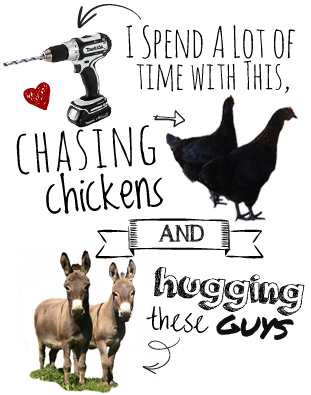 It’s a dream of ours to do exactly whay you did, buy and old farm house and renovated it, so we are clearly living through you! I am still really loving your beachy bathroom and think I would go with a larger vanity like that again. I’m not really feeling the built-ins that much. Is this the main floor guest bathroom? Only bathroom on the main floor? I think it looks really nice with the fixtures that are in it now. If its main purpose down the road is not full time use, consider how much storage it will really need. We remodeled our main, guest bathroom with little storage, because most of our daily use stuff is in our master bath instead. I think you did a great job with your portable storage, it looks like it gets the job done and doesn’t look too bad. 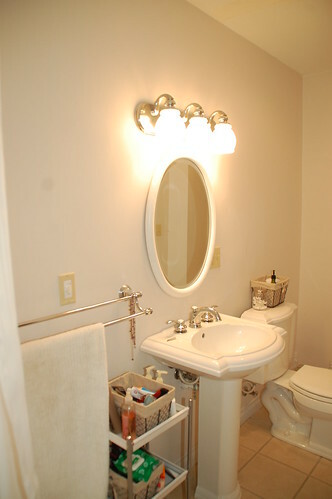 I think you should use the built-in idea around the main bathroom door(second photo)- with maybe some open shelves near the toilet/vanity – as step one (designed similar to your last two photos), and later on when you get back to doing tile, see what more needs done at that time…. I think built-ins could make the narrow room feel smaller. What about putting in some recessed shelving in the wall between your shower and sink, and also in the wall next to the toilet? And then an open shelf above your pedestal sink? I think you could get a ton of useful storage that way without closing the room up at all. That is exactly what I was going to suggest. I think floor to celing would box it in too much. And those are nice fixtures so go with the cottage look they provide. Build some nice open cottagy 48″ high shelves between the toliet and the far wall and between the the sink and the shower with some nice baskets for storage. Maybe the back of them could be beadboard. Put a couple of hooks above the shelf or on that small wall outside the shower for towels. And a shelf above the vanity like the picture. The whole room would look kinda awesome with the white fixtures contrasting against some BLACK beadboard on the trim and walls! I think it would work really well. The bathroom currently does look vanilla or “blah” and I can see the built ins adding interest and tieing in the toilet area. And duh, storage, who doesn’t have storage in a bathroom. Could you recess shelving between the studs? Most of the items stored in the bathroom are pretty shallow, so you could still get a lot in there. Or look into a medicine cabinet that is a picture frame instead of a mirror. Displays art, hides storage! 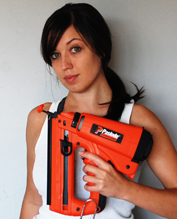 I think I am going to use 2 of them in the bathroom we are about to build. My inclination would be to do what you’ve sketched out between the sink & tub and across the top and include a narrow column of storage on the far side of the toilet. Make the whole thing shallow enough so that you don’t lose the fabulous corner detail at the baseboards. I would probably paint it to match the walls but matching the trim works also. Put doors on the storage below the towel hanging spots and on some (or all) of the ones on the far side of the toilet. The open spots can be used for display as well as holding baskets of stuff. You might even want to put a shallow drawer right under the towel hanging spots. I’d use color in shower curtain, towels & rugs to combat the vanilla-ness. Change out the mirror with the one from your Rustic Beachy Bath and hang a picture of some sort over the toilet to balance the mirror. And probably some more art on the opposite wall so it doesn’t feel left out. How’s that for a brain dump? I probably should get back to work now – thanks for the mini break! I’m a new reader and I’m enjoying reading your archives. I personally think the large built in will look heavy, especially if it goes all the way around the sink. What about taking the towel bar down and moving it to the other wall, then making a shelving unit to the left of the sink? I like the look of the vertical paneling behind the shelves in the last picture. 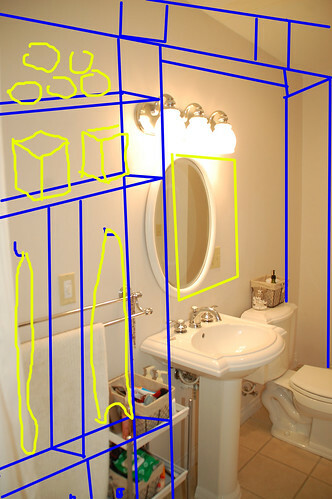 I like the built-ins idea and think a shelf that spans the sink and toilet would tie things together. There are some pretty creative solutions to awkward spaces on that site. FYI: this is my 1st comment, been lurking and loving your site for quite some time. Keep up the awesomeness! I think it might turn out pretty nicely. Adding paneling (http://theurbanfarmhouse.typepad.com/.a/6a01287699c3f2970c013486fb6d11970c-800wi) might help the whole feel more intergrated. If you get to a point where you’re seriously considering taking that course, do this: Buy some white craftboard. It’s just paper-coated styrofoam, and it’s cheap. Then make a full-size mockup which can be held together with tape. Put it in place and see how it looks. That method saved us a lot of grief. I was seriously considering a wooden valence in our master bedroom, but when I did the mockup, I knew it would not fit well. All it cost me was a few bucks for the materials and a couple of hours of my time. I think your idea will box it in too much, but, as I say, do a mockup. you should take a look at this bathroom, i think this is similar to what you’re planning to do. 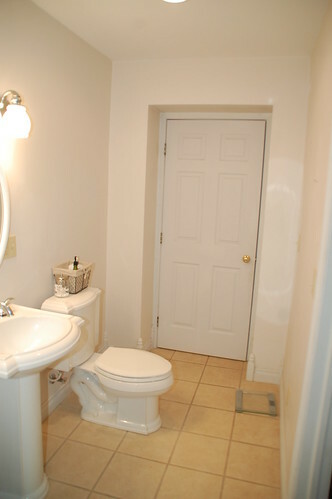 I agree,;that toilet is in a super awkward position! I think this is a good idea. I hope it helps balance out the room for you. Can’t wait to see the results! I would move the toilet back by the shower. 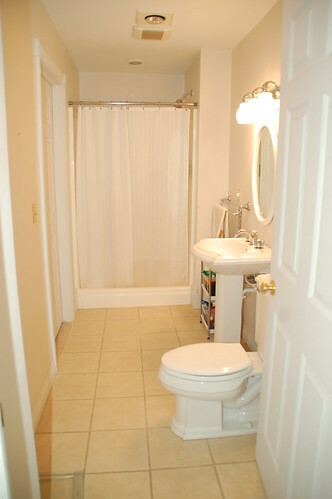 The room is narrow, so that would address both the open the door/fall over the toilet problem and the narrowness. I’d not replace the sink with a vanity, the latter would make it look more narrow. You could put open (brass wire?) shelves above the toilet in its new location without making the room seem too closed in. I don’t think you need as much storage space just for bathroom stuff as you have sketched in. Hmmm…the toilet placement is the same as ours in the master bath and at first it bothered me, but in the middle of the night when ill, having it be the first thing you come across isn’t so bad. The word LOVE regarding the shelf above the sink almost makes that feature the one that finds it self in there for sure. The first thing I thought about the shelves was (1) it will box in the sink and (2) why have shelves clear up to the ceiling when you are only 5’3’? At some point the cleaning/dusting aspect will rear its head and it seems like whatever items that high up would be only decorative. I would definitely keep looking at other ideas til you come across ones you LOVE, and maybe think about how the bath will fit into the whole house decor. I love lots of shelves normally but they can fill up and be messy too…having a place to hide stuff is not a bad idea. If another person were living in the house,(Mystery Man II) or if this bath becomes the guest bath, the picture of twin sinks might be something to consider as well, especially if you’re going to take out the tile and move the toilet. Men and guests may appreciate some counter space as well so a modified vanity or sorts may work, not too wide but with storage underneath. I took a look at the IKEA hackers link that Lynette provided and toward the end as you scroll down there is a great idea of a vanity that is just open holes but the top of one of the narrower ones is very cool with stones set in…unusual and modern! If you have any walls that back up to closets, this may be an option. Having the bath crosswise at the back does limit storage options, but built-ins can be a real plus. I think built in storage is always a winner particularly in the bathroom. You’ve done an excellent job, please come and do the same for my bathroom now ha! I love the pedestal sink and although I can see the benefits of a vanity,you don’t have a whole lot of space for a big one there. I actually like your shelving plan and would go for it. Just posted a narrow bathroom pic on your FB to check out. Hope it helps! Concerned that all that shelving will make the room feel more narrow. I think built-in bathroom cabinets will be a lovely idea, you should pursue that idea. There are tons of ideas out there, but the one you stated above is pretty good too. Your bathroom looks clean and neat, but adding some cabinets might not be a bad impression. I love your mirror and lightings, by the way. Built-in are a great way of utilizing the unused space, but it would be better if you could sit in front of area with graph papers. Try not to use anything around the toilet seat; this will give more of clustery feeling to the bathroom. Adding paneling might help the whole feel to be more integrated. Try to make sink / cabinet the dominating features. I really like the wood frame mirror. It’s make the bathroom more color than just a boring white. Also those decoration is good too. But I’m thinking about blue paint … not blue just patel blue for a wall. It would be nice and colorful.